Definition at line 58 of file lltransfersourceasset.h. Definition at line 42 of file lltransfersourceasset.cpp. Definition at line 49 of file lltransfersourceasset.cpp. Definition at line 160 of file lltransfersourceasset.cpp. Definition at line 95 of file lltransfersourceasset.cpp. References FALSE, gAssetStorage, LLTransferSourceParamsAsset::getAssetID(), LLTransferSourceParamsAsset::getAssetType(), llendl, llerrs, LLTS_DONE, LLTS_ERROR, LLTS_OK, LLTS_SKIP, llwarns, mCurPos, mGotResponse, LLTransferSource::mLastPacketID, mParams, LLAssetStorage::mVFS, NULL, LLVFile::READ, and TRUE. Definition at line 54 of file lltransfersourceasset.cpp. References FALSE, gAssetStorage, LLAssetStorage::getAssetData(), LLTransferSourceParamsAsset::getAssetID(), LLTransferSourceParamsAsset::getAssetType(), LLTransferSource::getID(), is_asset_fetch_by_id_allowed(), llendl, LLTS_ERROR, llwarns, LLAssetType::lookupHumanReadable(), mParams, responderCallback(), and LLTransferSource::sendTransferStatus(). Definition at line 166 of file lltransfersourceasset.cpp. Definition at line 179 of file lltransfersourceasset.cpp. 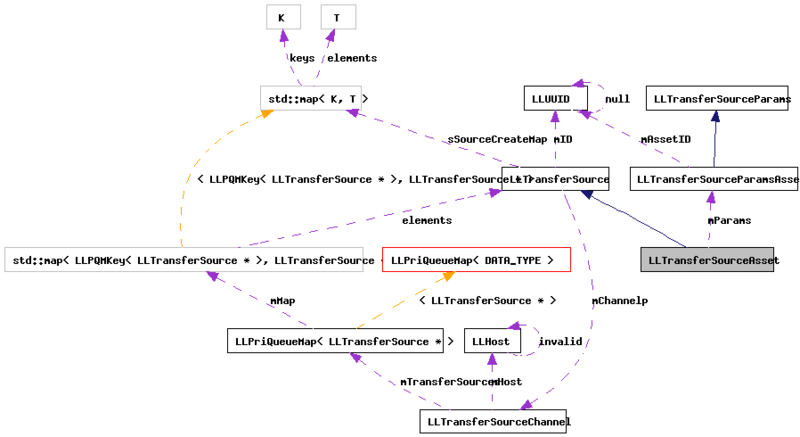 References LLTransferManager::findTransferSource(), gAssetStorage, LLAssetStorage::getErrorString(), LLVFile::getSize(), gTransferManager, LL_ERR_ASSET_REQUEST_NOT_IN_DATABASE, LL_ERR_NOERR, llendl, llinfos, LLTS_ERROR, LLTS_OK, LLTS_UNKNOWN_SOURCE, mGotResponse, LLTransferSource::mSize, LLAssetStorage::mVFS, NULL, LLVFile::READ, LLTransferSource::sendTransferStatus(), and TRUE. Definition at line 172 of file lltransfersourceasset.cpp. Definition at line 90 of file lltransfersourceasset.cpp. Definition at line 83 of file lltransfersourceasset.h. Definition at line 81 of file lltransfersourceasset.h. Referenced by dataCallback(), and responderCallback(). Definition at line 80 of file lltransfersourceasset.h. Referenced by dataCallback(), initTransfer(), packParams(), and unpackParams().